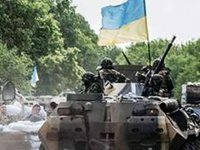 Ukrainian President Petro Poroshenko has said that the Ukrainian Armed Forces have liberated the town of Zhdanivka in Donetsk region. "The Ukrainian Armed Forces have heroically liberated the town of Zhdanivka in Donetsk region. Glory to Ukraine!" he wrote on his Twitter page on Saturday.